What did you have for breakfast? Eggs? Scrambled? Were they good? Of course! 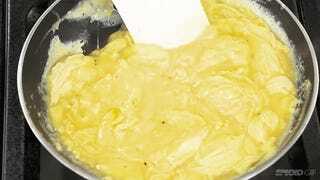 Everyone loves scrambled eggs and any variation of it is edible. But there are very easy ways to make scrambled eggs more luxurious and pillowy and delicious. America’s Test Kitchen says to add extra yolks, add dairy, whisk with a fork so you don’t over whisk, and to first cook the eggs on medium-high heat and then on low. I do most of these things already! You probably do too. America’s Test Kitchen explains the science of those 4 tricks in the video below.